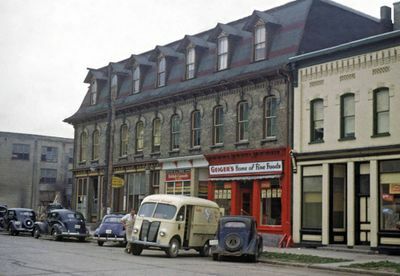 City block in Hespeler, Ontario, in which the Hespeler Mennonite Brethren Church rented worship space, 1949. The Hespeler Mennonite Brethren Church began as a branch of the Kitchener Mennonite Brethren Church and remained so from 1926–1932. Like its mother church, the Hespeler congregation was made up of Mennonites who had immigrated to the area in the 1920s from the Soviet Union. Membership climaxed at 31 in 1933, but remained below 20 for most of the church’s existence. After meeting for a time in the Wanner Mennonite Church, the Mennonite Conference of Ontario congregation in the area, the Mennonite Brethren in Hespeler moved their services to the home of Jacob Bartel. By 1932, the congregation had outgrown the Bartel home, and began renting space in a local hall. Plans to construct a new church building never materialized. In the early years, the congregation was served and supervised by Kitchener leaders, such as Jacob P. Friesen, Jacob W. Reimer, and Jacob P. Wiens. In 1932, Dietrich Klassen served as the first minister of an independent Hespeler congregation. From 1934–1945 the congregation was without a minister, a situation that was remedied in 1944 when Jacob Bartel took the leadership role. Johann Schoenke assumed the position in 1944 and served the church in this capacity until its dissolution in 1953. Dueck, Henry H., ed. He Leadeth: History of the Mennonite Brethren Churches of Ontario 1924-57, Kitchener, 1957. By Henry H. Janzen. Copied by permission of Herald Press, Harrisonburg, Virginia, from Mennonite Encyclopedia, Vol. 2, p. 718. All rights reserved. Hespeler Mennonite Brethren Church (since 1953 merged with Kitchener Mennonite Brethren Church), located in Hespeler, Waterloo County, Ontario, a member of the Canadian Conference of the Mennonite Brethren Church and also of the General Conference of the Mennonite Brethren Church of North America, was organized on 20 November 1932, under the leadership of J. Bartels. The membership in 1948 was 19. The congregation met in a rented hall with the members of the United Mennonite Church. The ministers who served the church were Jacob Wiens, Dietrich Klassen, Isaak Ewert, and Jacob Sudermann. Tiessen, Isaac H. "Hespeler Mennonite Brethren Church (Hespeler, Ontario, Canada)." Global Anabaptist Mennonite Encyclopedia Online. February 2017. Web. 25 Apr 2019. http://gameo.org/index.php?title=Hespeler_Mennonite_Brethren_Church_(Hespeler,_Ontario,_Canada)&oldid=147238. Tiessen, Isaac H. (February 2017). Hespeler Mennonite Brethren Church (Hespeler, Ontario, Canada). Global Anabaptist Mennonite Encyclopedia Online. Retrieved 25 April 2019, from http://gameo.org/index.php?title=Hespeler_Mennonite_Brethren_Church_(Hespeler,_Ontario,_Canada)&oldid=147238. This page was last modified on 21 February 2017, at 16:19.